There are a lot of things to think about when selecting a pet for your family. You want to make sure that you can afford their food, bedding and regular veterinary checkups. You should have enough space for the animal in your home. You’ll want to choose an animal that can get along with the other people and animals in your house. You should also make sure that the pet you decide on doesn’t cause any potential allergy issues for people in your home. Reptiles are a good option for many families. You can try this website to find out more information about the different kinds of reptiles that are available. You can also check with your local shelter or pet store to find out about the snakes, lizards and other reptiles that are ready to be adopted. 1. How much care will they need? Some reptiles require constant attention. Depending on the kind of reptile that you adopt, you may need to be concerned about their stress, nutrition and any possible illnesses. You may need to make arrangements to have a friend or family member take care of them if you’re going to be gone for an extended period of time. It’s also a good idea to have a nearby veterinarian who is familiar with the kind of reptile that you have, so they can properly diagnose and treat any illnesses or injuries that may occur. 2. They usually aren’t hands-on pets. Unlike dogs, cats, ferrets and similar animals, reptiles are pets that you probably won’t be holding too much. The one exception is different kinds of snakes. Some reptiles have been known to carry salmonella, which is a bacteria that can be spread through direct contact with feces or with a human or animal that has been contaminated. The bacteria can be spread orally or through any open wounds or sores. If you do handle your reptile often, make sure to wear gloves or wash your hands thoroughly before and after handling them to reduce your chances of contracting this disease. Their diets can generally vary by species. Some reptiles eat live food like mice,brine shrimp, crickets and worms, while others are content with just having fresh fruit and vegetables. You can raise live animals for your reptile’s food, but this can be both timely and costly. Talk to your veterinarian for recommended foods for your reptile and to learn how often they should be fed. Some reptiles need to be fed daily, while certain others like snakes only need to be fed once a week. 4. Reptiles usually require different temperature conditions. 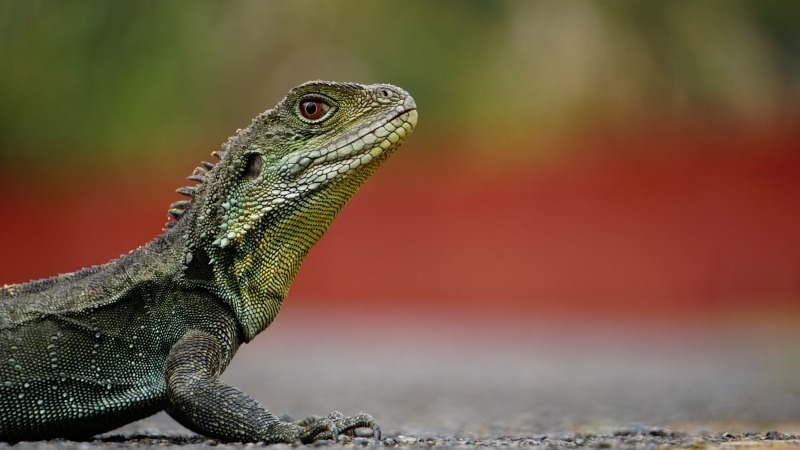 Reptiles are cold-blooded, which means they don’t do well in colder temperatures. They need living conditions with enough heat to keep their body temperature within accepted levels. You may want to invest in a cage or other enclosure for your reptile, along with heat lamps, radiant heaters and a good thermometer so that you can monitor any temperature changes that may occur. They usually do well in areas with stable humidity levels, but you can also buy misting equipment, foggers or a humidity alert device to monitor these situations. 5. How big do they grow? Some reptiles such as snakes can grow to 5 to 10 feet long or more as adults. This means that you’ll need to plan their living environments carefully. You’ll need a good cage, terrarium or similar housing that is big enough for them as they continue to grow and move around. It should be something sturdy but also something that is escape-proof. You’ll also have to consider the time needed to clean their homes and sanitize them on a regular basis. 6. Every state has regulations. Depending on where you live, there may be rules and regulations about the kind of reptiles that you can own. Every state has their own regulations regarding this. Check with your local Fish and Wildlife to see what kind of reptiles that people are allowed to own in your area. These are just some things to keep in mind if you’re considering having a reptile as a pet. While they may not be as affectionate as other popular pet choices, they can show appreciation in other ways. Reptiles are often very interactive with their owners. They can be a very calming presence after a busy, stressful day. They usually don’t require a lot of maintenance once you’ve established their living quarters. All reptiles need are food, a clean place to live, and a little love. My child has been bugging me for quite some time about having one. I am scared of reptiles for one thing but upon reading your article, I can almost say that maybe we can have one. And of course, as long as my child is responsible enough to care for one because I won’t be looking after them myself.